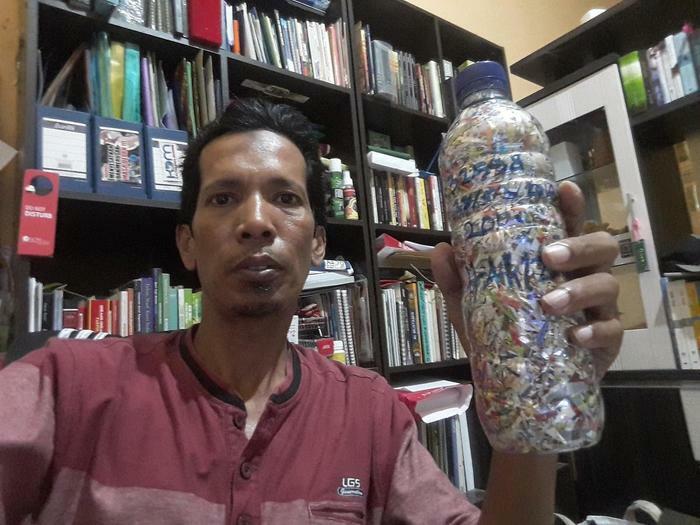 Hamzah Bontang just ecobricked 200 g of plastic in BONTANG, Indonesia. Hamzah used a 600ml bottle to pack 200 g of community plastic to make their number 1 ecobrick. Based in the community of Yayasan BIKAL KARYA LESTARI they are working hard to keep plastic out of the local biosphere in Indonesia. The ecobrick has a density of 0.33g/ml and is permanently marked with Serial Number 32598 that can be looked up anytime to get the full details on this ecobrick. The ecobrick was logged on 03/23/2019. Sign up and get going on GoBrik yourself! Together we can pack tons of plastic and build our greenest visions. Click here to launch GoBrik. We see a Transition in our Homes, Communities and Companies from Plastic to ever Greener Harmony with Earth's Cycles. We envision a Transition in our Homes, Communities and Companies from Plastic to ever Greener Harmony with Earth's Cycles. Also know as Eco Bricks, Eco-Bricks, Ecolladrillos, and bottle bricks, WikiPedia now officially recognizes the concept as a single word: Ecobrick. The Vision Ecobrick Guide and all the illustrations, photos and text content on this site by the Global Ecobrick Alliance is licensed under a Creative Commons Attribution-ShareAlike 4.0 International License. When plastics are littered, burned or dumped, they poison the Earth, Air, and Water. When we save, segregate and pack plastics into bottles, we can make building blocks that can be reused over and over again. Together we can build green spaces that enrich our community and environment.